It has been some time since Mary Poppins last visited the Banks children but she’s returned to instil some magic and positivity into the lives of the Banks family. Mary Poppins Returns takes a relatively familiar magical story and brings you along this journey through wondrous landscapes, beautiful sets, and fantastically choreographed musical numbers. The plot itself is a solid family-centric tale that is nothing short of fun and enjoyable for all ages. It progresses at a decent pace with some occasional dips but before you know it the 2 hour runtime flies by in part due to the upbeat musical numbers. 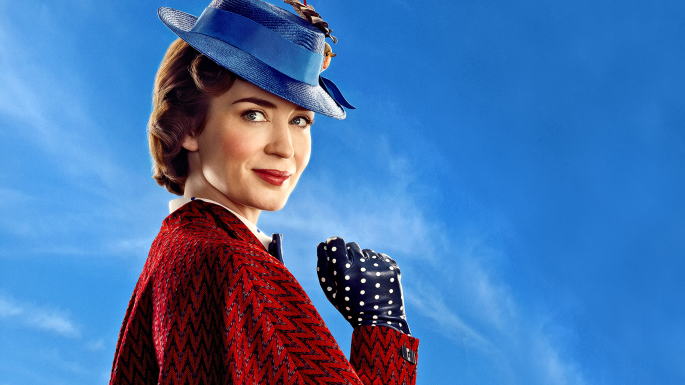 Directed and co-written by Rob Marshall, the magic of the original Mary Poppins is emulated through this story that focuses on a lot of that same tones and values as the 1964 classic. Marshall brings with him his experience with 2014’s Into the Woods to build this fully realised and fleshed out musical world full of great characters and plenty of fun. The music and the choreography is where this film shines brightest. With incredible set design and costuming the musical numbers are never too busy or too bland. There’s always a lot happening on-screen but never so much to where it’s overwhelming. The sweeping choreography of mass extras through the London streets and other environments is mesmerising and you’d be remiss to look away at any point. The implementation of the hand-drawn 2D animation style synonymous with the original film is undeniably phenomenal. The sequence in which the 2D animation is front and centre is wonderful and one of the highlights of the adventure. The heart and soul of this story though is Mary Poppins herself and no-one could have captured the spirit and magic of the character here besides Emily Blunt. Whether she’s conversing, singing, or not even talking she commands the screen and her presence is greatly felt throughout the entire runtime. It could have been hard imagining an actress besides Julie Andrews portraying the iconic character but Emily steps up to the plate and delivers. She fits the magical and mystical role so well and her singing voice is just as good as her acting talents making her the shining light of every scene. As for the rest of the performances they’re all good with the only other character and performance standing out above the rest being Lin-Manuel Miranda as Jack. He’s one packed full of musical talent and it shows because he’s also pretty incredible through each of his scenes. Each of the main characters have a positive influence on the tone of the story but aside from Mary, Jack definitely shines brightest. His journey albeit never front and centre is engaging and a joy to follow. The older Banks’ Michael and Jane played by Ben Whishaw and Emily Mortimer respectively have an intriguing journey despite not always being the immediate focus of the film. The performances from Emily Mortimer and Ben are good although I didn’t connect with them more than other characters. The young Banks’ portrayed by Pixie Davies, Nathanael Saleh, and Joel Dawson I thoroughly enjoyed watching. They bring with them this innocence that plays into the story with seeing all of this magic and wonder from the point of view of a child. I enjoyed their presence and didn’t find their characters or antics at all irritating. In the end, Mary Poppins Returns is a fun time from beginning to end. It’s nothing too spectacular but it nails the tone and magic of the original film creating a wondrous adventure that the whole family can enjoy. Emily Blunt is the star of the show with an incredible performance as the titular character that makes the film. The musical numbers are exciting and packed with great choreography to hold your attention. So if musicals are your thing I wouldn’t look past checking this one out.